Learning as We Go....: 16 Weeks and Lots of Perks! 16 Weeks and Lots of Perks! Baby Keene was 16 weeks old on Friday!!! 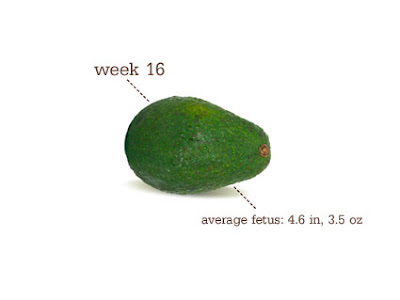 According to www.thebump.com, that makes him or her the size of an avocado. (Last week, though I didn't post it, he or she was estimated to be the size of a naval orange. I'm not sure how an avocado is bigger than an orange, but I'll go with it...) In addition to getting bigger and longer, Baby Keene is beginning to be able to pick up voices. Which is a good thing, considering Daddy and I have been talking to him or her for quite some time now! It's good to know that we are actually being heard now! Now, when we read baby books to my belly and have random conversations with the baby, it's not in vain! Another important milestone..... I think I felt Baby Keene move!!!!!!! It's hard to know for sure since I've only felt it that once, that I know of. Wes and I were on our way home Saturday night and all of a sudden, I felt a very strong 'fluttering' feeling. It was so exciting! I had a smile on my face for several minutes and was just holding my breath, trying to feel it again. Wes put his hand on my stomach, which is really funny because, unfortunately, Wes won't be able to feel the baby move on the outside for a bit yet. Believe me, he can absolutely NOT wait to feel Baby Keene move!!! Anyway, I haven't felt the movement that strong since then. There are a few times when I'm not sure if it's the baby moving or just .....ahm...gas. Then again, it's really hard for me to lay still, which is how some of my books recommend you be to feel movement this early. It's definitely exciting, that's for sure!!!! Time to Share all those Secrets, Mommies! You are my "I love you!" The images and words on this site are the sole owner of the author of this blog. Do not copy. Awesome Inc. theme. Theme images by molotovcoketail. Powered by Blogger.